We Search for Roots | Sprezzatura, Y'all! Steve is half Italian which is one of the reasons we got hooked on Italy to begin with. His grandparents came to the U. S. in 1900 and never went back. Like any good Italian tale, there’s a legend here. The story goes that his 16 year-old grandmother met his 21 year-old grandfather on the boat on the way over. Sometime between then and 1904 when Steve’s Aunt Mary was born, they married and settled in Rome, Georgia. The story also goes that his grandfather, Vittorio, had $2 in his pocket when he landed at Ellis Island (the amount varies with each retelling, but it wasn’t much). Through some diligent research (thanks Ancestry.com), we’ve discovered that they were born about 30 miles apart from each other. Years ago, Steve and I visited his grandmother’s birthplace and found out a great deal about her family. Now we have more research and decided to pay a visit to their birthplace to see what else we could find out. They were born in the Piedmont (Piemonte in Italian) region. That’s in the northwest part of Italy near Turin. It’s a beautiful part of Italy and is best known for its great wines. Barolo, Barbera, Barberesco and many other fabulous wines come from this region. Not to mention Asti Spumanti. If you tell any Italian you’re going to the Piemonte, they will say, oh, they have great wines there. No kidding – we’ve have some outstanding wines since we’ve been in Italy, but the wine up here is something else altogether. Rich, dark reds that are smooth and silky. But that’s not why we’re here – it’s just an added bonus. Steve knew his grandmother but not his grandfather. We have much more information on her than we do on him. Clay, Steve’s youngest son, has done a lot of research on his great grandfather and has established a relationship with someone in his birthplace of Valenza with the same last name – Annaratone (or Anarratone – apparently there are different ways of spelling it). Massimo has been very helpful, although he doesn’t know anything about Vittorio. He directed us to the anagrafe (the records office for the area) and told us that this name is specific to Valenza, not Piemonte, just Valenza. This makes sense, because when we are in other parts of Italy, no one knows this name. Italy is the same with names as it is with food. It’s very region specific. If you say your last name is Cuomo – everyone knows you’re from Naples. If it ends in -lan or -len you’re from the Veneto region. Annaratone stumps everyone and now we know why – it’s only in Valenza. We learned a lot about Steve’s family on this trip and are continuing our research with our newfound information. Piemonte is a beautiful area, very much like Tuscany and Umbria. Rolling hills, vineyards, farms, hill towns. But in many ways it’s very different. The north of Italy is more industrial and you see this driving through Piemonte. It’s also more populated, so even though there are beautiful stretches of open country and farm land, you get the feeling of more density. And then there’s the fog. 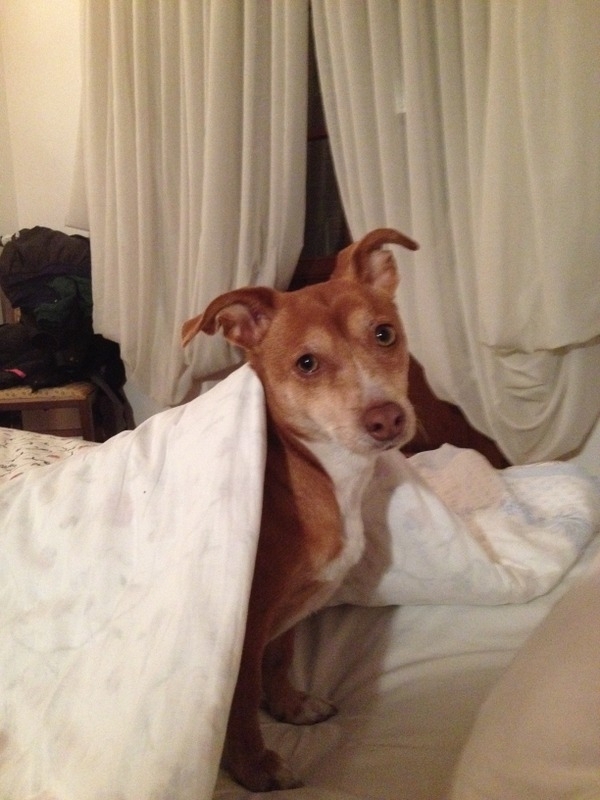 Nebbia in Italian. It’s so pervasive that they named a grape for it – nebbiolo, the grape used in the big red wines in Piemonte. Nebbiolo grapes love the fog, but too much and they develop some kind of fungus. So, as with any agricultural endeavor, it’s up to Mother Nature whether it’s a good year or a bad year. But when it’s good, it’s unbelievable. The fog is something else in Piemonte. The days start out very foggy – so much so that you can’t see ten feet in front of you. The sun burns most of it off by mid-morning, but there’s always a haze – sometimes clinging to the ground, sometimes higher up. We’ve only been to Piemonte in the fall, so I’m not sure what it’s like in the spring and summer. But I think that naming a grape after the fog tells you something about the weather. The food is also different. They have regional specialties, of course, like bagna cauda, a garlickly spread that has anchovies and olive oil and makes your breath really bad for a really long time. Another specialty is vitello tonnato, which is cold sliced veal topped with a creamy sauce of tuna, anchovies, capers and mayonnaise. Sounds horrible, but it’s quite good. They also cook with a lot of red wine, as you can imagine. Beef slow cooked in Barolo, for example. This can become a ragu served over pasta, or a dish on its own. One of the pasta specialities is agnolotti. This can be found in most parts of Italy, but supposedly originated in Piemonte. (Myra, we learned how to make this in our pasta-making lesson.) 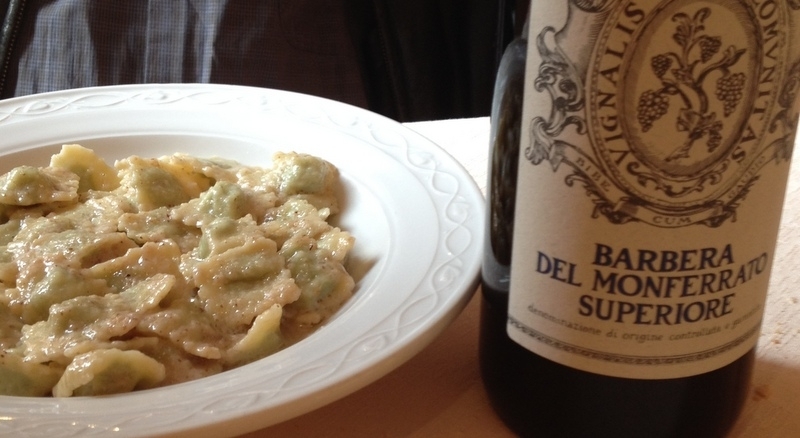 You don’t see it on the menu much in other parts of Italy, but it’s on every menu in Piemonte. Well, OK, we didn’t eat at every restaurant, but we sampled a good many. It’s similar to ravioli, and is generally stuffed with a meat mixture and usually topped with a simple oil or butter sauce. We’ve been to Piemonte a couple of other times, once with Tim and Julie. On that trip, we had one of the best meals we’ve ever had in a little town called Moncalvo, near Asti. We were determined to find the restaurant on this trip and with one or two false starts, we went right to it. It’s still there, owned by the same people and just as wonderful as ever. It’s called L’Osteria Aleramo on Piazza Carlo Alberto in Moncalvo. If you’re ever in the neighborhood, stop by. We first went in 2001 and 14 years later it’s still as good. Our dinner there was a feast. In addition to the vitello tonnato, slow roasted beef in Barolo, slow cooked ragu with barolo, and agnolotti from above, we also had bacala over carmalized onions, a wonderful artichoke and truffle salad, and panna cotta. Oh, and these little appetizers that are puffed pastries, stuffed with cheese, and flash fried. I forget the name of them and we ate them so fast I didn’t get a picture. Yes, we ate all that. No, we’re not proud of it. Yes, it was worth every calorie and extra roll around the middle. 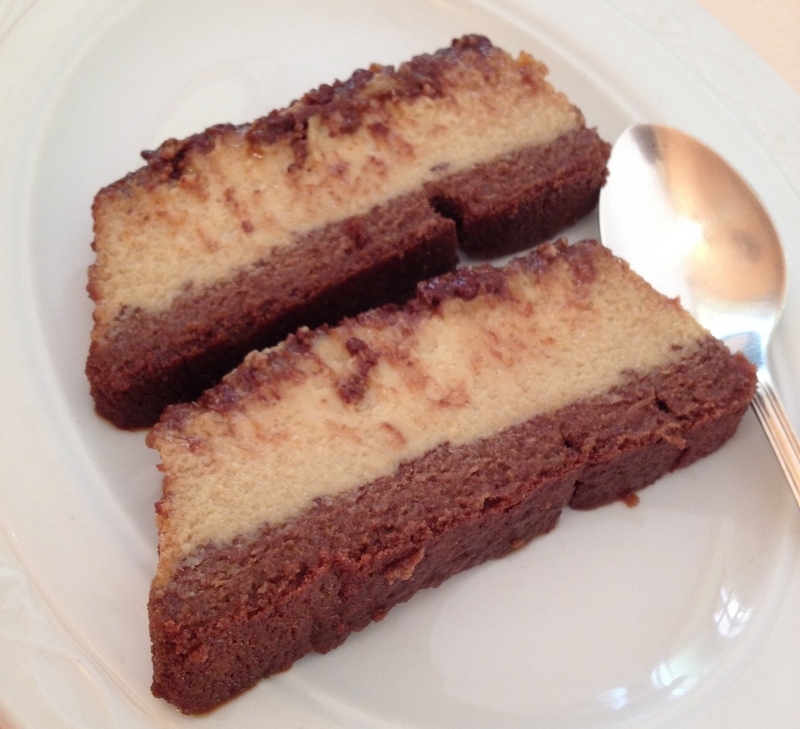 Another specialty of the region is bonet, a chocolate dessert that’s part custard, part chocolate cake, part caramel, part rum, and completely delicious. If you think the name sounds French, you’re right. This part of Italy has many French influences in the food – more butter and cream, less tomatoes. Bonet is typically made in a custard mold which when inverted on the plate looks like a hat, or bonnet in French. The lengend, you know there’s always a legend, is that the hat is the last thing you put on when you leave and the bonet is the last thing you eat. So much great food. 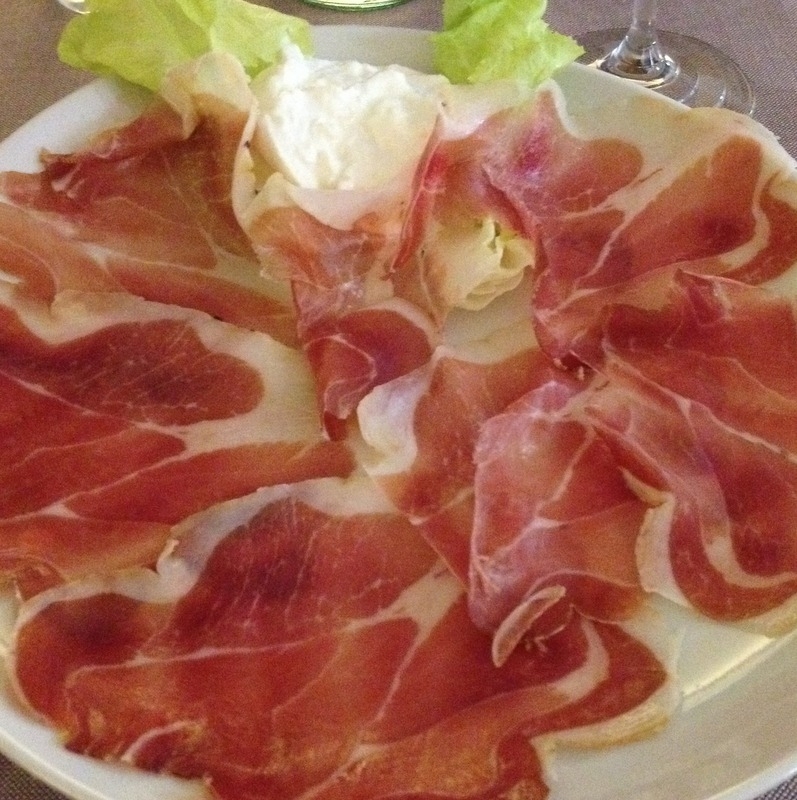 We had a great plate of Parma ham and burrata. OK, Parma is not technically in the Piemonte region, it’s in neighboring Emilia Romagna, but it’s close. This ham was incredible and burrata with it was perfect. Burrata is mozzarella blended with cream to make a smooth, creamy, gooey, slightly sweet, delicious spread that goes perfect with the saltiness of the prosciutto. It’s creamy inside, almost liquid, and has a firmer shell around the outside that’s mostly mozzarella. You break it open and it oozes out, you slather it onto the meat, and you smile. And do it all over again. we had to investigate. It was farinata, and while I’m not entirely sure it is unique to Piemonte, I’ve not seen it anywhere else. It’s made with chickpea flour, olive oil, water and salt. It’s cooked in a wood oven and resembles a big pancake when done. It’s golden brown and bubbly and is best served right out of the oven. We waited for a new batch to come out of the big wood oven and it was worth the wait. She cut it into little semi-circles and gave it to us on a plastic plate and we went off to find a park bench from which to devour it. Good and hot, tasting kind of like a hummus pancake, it was a great little mid-morning nibble. Our time in Piemonte was special. We feel a connection to this place and can’t help but wonder what it was like in the late 1800’s when Steve’s grandparents lived there. What was their life like? Where did they live? Why did they never come back? Many questions which will remain unanswered, but at least we walked on the same soil and saw the same vistas. We thought of them and of their great-great grandchildren back in the U.S. and thought how proud they would be of what they left to the world. I think they would be happy that we’ve completed the circle back to their birthplace and will instill in their progeny an appreciation for their culture. Thank you to Vittorio and Concetta for stepping on that boat 115 years ago and making a life in America that lives on to this day. May it continue on for many generations to come. I couldn’t wait for this post! Great one, Cathy! What a memorable trip! Hope you are home safely and ready to enjoy the beautiful Christmas season in Anghiari! Thanks, Julie. It was great and the trip was not bad at all. Got home last night and are settled back in to our little apartment. She’s been married to an Italian and Catholic for long enough to get it! Wonderful experience. Wonderful area. I keep thinking about our grandchildren and how much this really means to them. What a thrill! What a liovely tribute to the Anthony family.Their grandmother was a orecious lady!She always offered you a coke in the small bottle.Aunt Mary was also dear to me!She spent alot of time with my children& in our home!.She taught me a lot about family.She & Horace would love what you& Steve are doing!Drew mentioned how much he was enjoying hearing about the family in Italy!Have a wonderful Christmas!Know you will missed ! I’m sorry I didn’t know their grandmother and didn’t get to Aunt Mary better. I know Aunt Mary thought the world of you and I”m so glad you were in her life. I wish we could ask them all questions now that we know a little more about their origins. It’s a fascinating story. I’m so glad we have good friends here who are opening their home to us at Christmas – otherwise we would be very sad people on Friday! Miss y’all all so much, especially the little ones at this time of year. When we get back, we’re having an Annaratone reunion with the whole gang!